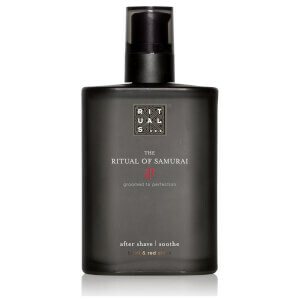 The Ritual of Samurai After Shave Soothing Balm is an alcohol-free post-shave treatment that helps to soothe stressed skin after shaving. Part of the Ritual of Samurai collection, the formula takes inspiration from Japanese Samurai warriors and the pride they took in their personal appearance. The warriors used careful grooming traditions to create an appearance that built power, control and confidence to support in their battles. Lightweight and comforting, the skin-soothing after shave balm delivers a calming and soothing effect post-shaving, helping to aid the healing and repair of stressed skin to restore a sensation of comfort. Helping to calm and reduce the appearance of redness, the naturally formulated balm contains Rice Bran Oil for its nourishing and hydrating properties, plus antioxidant Basil, known for its astringent and moisturising benefits. Also contains Red Shiso (anti-inflammatory properties) and natural antioxidant Vitamin E.
Apply balm on clean-shaven, dry skin.